Professor Todd Davenport, and emeriti professors Paul Tatsch and Doris Meyer received the Faculty Mentor Award from the Pacific Alumni Association on Nov. 11. 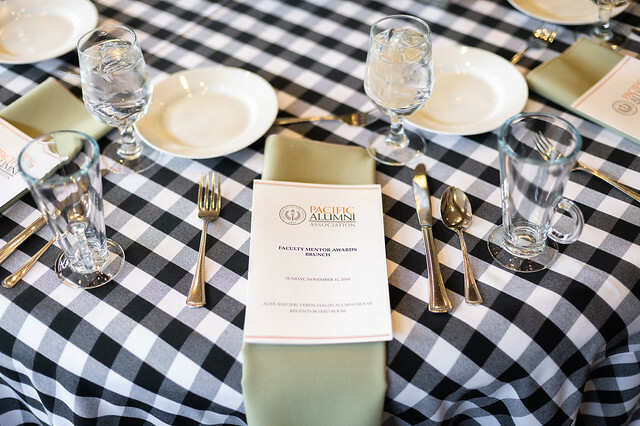 The Pacific Alumni Association honored three recipients of the 2018 Faculty Mentor Award at an awards ceremony and brunch on Sunday, Nov. 11, in the Alex and Jeri Vereschagin Alumni House. The award recognizes faculty members who have been lifelong mentors of students and alumni and have encouraged alumni to become mentors of students. The 2018 recipients were Todd Davenport, professor and director of the Doctor of Physical Therapy program in the Thomas J. Long School of Pharmacy and Health Sciences; Doris Meyer, emeritus professor of health, exercise and sport sciences in the College of the Pacific; and Paul Tatsch, emeritus associate professor of business in the Eberhardt School of Business. Davenport joined the faculty at Pacific in fall 2007. He has been program director of the Doctor of Physical Therapy program for the past two years. He appreciates the small class sizes that make it possible to really get to know students and an educational process that's not "one size fits all." Former students admire Davenport his unwavering commitment to help them maximize their potential by holding them to high standards while readily offering help when they struggled. He maintains an open-door policy and has "astonishingly quick email replies" according to Simone Gingras '16. They know they can email, call or text him anytime to talk about anything. "He is always easy to reach and always responds to former students' emails," said Adam Matichak, '15. Those who studied under him agree he is generous with his time, helping them to publish research papers, land internships and prepare to give presentations at national conferences. Gingras added that he answered "endless questions" about course prerequisites, GPAs and interviews when she was applying to the physical therapy program. Others recall his pep talks during midterms and the genuine interest he showed in their overall wellbeing. Michael Ellis, '17, remembers a Father's Day weekend one summer semester when he was separated from his family, and Davenport contacted him simply to see how he was doing. Davenport believes alumni belong to a family made up of the relationships they have forged at Pacific. "When they succeed, so do we," he says. "There's a crucial mutual benefit associated with giving to our alumni and having them give back to the university in the form of time, talent and treasure." Students say Davenport encouraged them to volunteer their time bettering the communities where they live. That's what Vien Vu '17, has done since earning his doctor of physical therapy degree. "He has constantly reminded me to think beyond school, which helped me get involved in community service, professional development, post-graduate education and leadership positions," Vu said. The research, committees and other activities Davenport is involved in outside the classroom have prompted students to joke that he never sleeps. But those who know him say that he's never so occupied that he forgets the importance of the human touch in a field like physical therapy. Matichak says Davenport taught him the value of taking the time to understand and meet patients' emotional needs regardless of how many others are waiting to be seen, a lesson he now applies to his own practice. "The most important patient of the day is the one you're with is his philosophy," said Matichak. Doris Meyer came to Pacific in 1956 and served as a teacher, coach and adviser until her retirement in 1990. One of few women professors when she began at Pacific, she directed intramural activities, advised the Women's Recreation Association and coordinated women's athletics. Meyer saw many changes during her three-decade-long career at Pacific and played a role in the transformation of women's athletics. When she joined Pacific, female students had only the option to participate in intramural and recreational sports, and opportunities were limited for those women who were considered elite. She recalled one of her students had no option but to play on the men's tennis team and another who joined the men's golf team. It would be years before the National Collegiate Athletic Association (NCAA) began governing national championships in women's sports, although Meyer participated in campus talks about that possibility. "I feel like one of the important contributions that we made at the university was the development of the women's athletics program," she said. Meyers loved the small community at Pacific because she had the chance to forge close relationships with students and faculty colleagues in her own department and throughout the campus. She especially enjoyed being an advisor for incoming freshman. Alumni have returned to campus to take her out to lunch to thank her for inspiring them. "That, of course, was part of the whole picture, of caring for the student," Meyer said. "I feel like I had a personality that didn't scare our students away, and it showed that I was interested in their development ... in fact, I can remember the names of those freshmen just as if it were yesterday." Meyer played an influential role developing the curriculum for physical education majors in College of the Pacific and for meeting the California state teacher credentialing requirements in physical education and adaptive physical education in the Gladys L. Benerd School of Education. The adaptive physical education program helped raise Pacific's profile among education circles in California. In later years, she also supervised student teachers in the School of Education. Meyer was inducted in the Pacific Athletic Hall of Fame in 1991 in recognition of her work coordinating women's sports on campus, and received the Faye and Alex Spanos Distinguished Teaching Award from College of the Pacific. She now enjoys remaining connected to the university through involvement with the Emeriti Society. "I feel like my life has been a really worthwhile one," Meyer said, reflecting on her career at Pacific. Emeritus professor Paul Tatsch taught business on the Pacific faculty for 24 years, from 1980 to 2004. Tatsch joined the faculty of the new School of Business and Public Administration (now the Eberhardt School of Business), which had recently been elevated from a department to a school. He taught finance, operations management and occasionally, economics. Tatsch always sought to provide students with a professional perspective on careers in finance and other business fields. He offered his students advice, counseling and professional contacts when he could. He considered it "just doing his job," but for students the impact was significant. He has maintained contact with them well into their post-Pacific career and family years, and that, he says, that is the best part of being a mentor. "Helping students recognize strengths which they may not have been aware of, as well as helping students deal with the realization that their goals/dreams might not quite match their skill set, provided me with rewarding, and sometimes challenging teaching and counseling opportunities," said Tatsch. "A successful academic career is determined by one's students. At least some, if not many, should be more successful than their professor/mentor," Tatsch said, recalling the advice of his own undergraduate mentor. Tatsch made that his own goal, and his students have gone on to achieve academic success in prestigious graduate programs at Harvard, Stanford, Berkeley and other institutions. Others have gone on to successful careers in finance and operations, taking their companies public, developing just-in-time inventory systems and optimizing logistics. "If it weren't for Dr. Tatsch, I may not have developed the professional interests and business curiosity that have served me well since graduating from Pacific, and I certainly wouldn't have become a diehard Tiger alumni," says Jim Collins '81.